We aim to ensure that students develop these skills and that they have the confidence to apply their mathematical knowledge across a range of subjects and situations. We want STUDENTS to believe and know that they “can do mathematics”. During year 7 and 8, students are taught at the appropriate level a balanced variety of topics from areas of Number, Algebra, Geometry and Measure and Statistics. They experience a wide range of activities such as group work, ICT, investigations, Maths Challenges etc. In year 7 and 8, we have started to follow a mastery approach to teaching. Research of best practice from around the world has shown that using a Mastery model to deliver the Mathematics curriculum enables students to develop a deeper understanding and recall of mathematical concepts and develop higher order thinking skills and strategies for problem solving. The delivery of content will focus on a deep understanding, which may include re-visiting content already met at Key Stage 2 but dedicated more to problem solving. They experience a wide range of activities including group work, ICT, investigations, Maths Challenges, Financial Literacy etc. Currently we are following the GCSE scheme from AQA as it is very well planned and resourced. However, we do look at other exam boards to ensure that we provide the best option for our students. 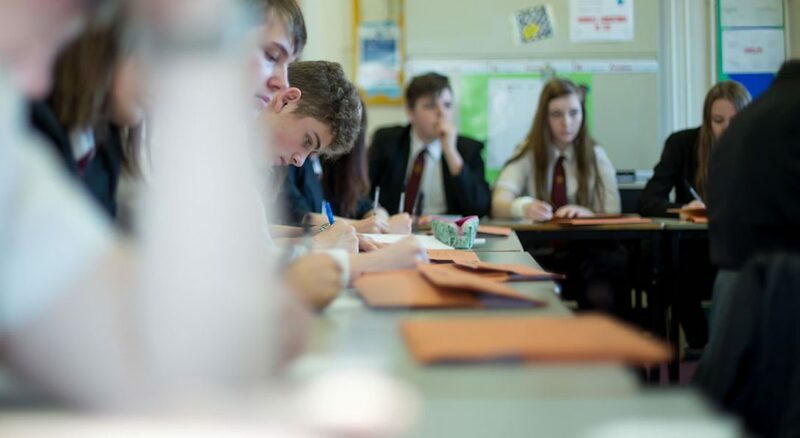 GCSE Mathematics is a linear course and students will be entered for either the Foundation or Higher papers depending on their ability and progress during the two years leading up to the examinations. At both entry levels, candidates are required to sit three exams at the end of Year 11. Each paper is 1hour and 30minutes, the first being non-calculator whist the remaining two are both calculator papers. The new GCSE is no longer graded A* to E but has the new format of 9 down to 1. The Foundation paper covers grades 5 down to 1, whilst the Higher paper awards grades 9 to 4. The attainment required for a pass is grade 5. This is equivalent to a high grade C to low-grade B attainment on previous GCSE exams. The content of the new Foundation paper therefore contains topics from the old Higher papers that were not previously examined at this level. At the Higher level there is additional content which previously was examined at A level. AO1: These are direct mathematical calculations, where the students can display their knowledge of methods and their ability to recall facts. AO2: Here the students are required to use reasoning and interpretation to help them answer the questions. They are also expected to layout their work clearly, explaining their reasoning and methods at all stages and drawing conclusions from the answers. AO3: These questions are normally the most probing. They require the students to both interpret information often given in written or diagrammatical form as well as draw on their mathematical knowledge from all aspects of their work rather than from a single topic. Here they are again expected to provide a clear narrative explaining their reasoning throughout the calculations and in a final conclusion. From September 2107, Mathematics will no longer be modular at A Level, but will be linear. Mathematics will help students develop their mathematical understanding, encourage them to think, act and communicate mathematically, providing them with the skills to analyse situations in mathematics and elsewhere. The mathematical knowledge they will gain will be broad and widely applicable, preparing them for a wide range of destinations. Content includes in-depth treatments of calculus and proof, alongside statistics and mechanics, preparing them for a wide range of destinations in Higher Education and employment. Due to the change from modular to linear, Mathematics will no longer be offered as an AS option but will be a 2 year course examined at the end of Y13. A Level Further Mathematics will both extend and deepen students’ knowledge and understanding beyond the standard A level Mathematics. Students who do it often say it is their favourite subject. As well as new learning new areas of pure mathematics, they will study further applications of mathematics in mechanics, statistics and decision mathematics. Studying Further Mathematics consolidates and reinforces standard A level Mathematics work, helping them to achieve their best possible grades. For students who are planning to take a degree such as Engineering, Sciences, Computing, Finance/Economics, Medicine etc., or perhaps Mathematics itself, they would benefit from taking Further Mathematics. Students who have studied Further Mathematics find the transition to such degrees far more straightforward. Further Mathematics is currently to be offered as both AS and A level. For both Mathematics and Further Mathematics, teaching and learning will most often take place in small groups. Strategies that are often implemented in addition to group work include using mini-whiteboards, good questioning techniques, encouraging discussion, jigsaws and using posters to explain understanding. Students are encouraged to be active in lessons as opposed to a “passive learning” style as this is often not the most effective teaching and learning strategy. Students in sixth form who have not achieved a grade 4 or above in GCSE Maths must complete a re-sit. Students must attend all lessons and complete independent study during the year. There are opportunities for students to re-sit in November and in June. Students who wish to re-sit their GCSE and who have already achieved a grade 4 should discuss the matter with the Curriculum Leader.